Janie Brookshire as Bella and Clark Scott Carmichael as Jack in the Rep’s production of “Angel Street.” Photo: Jerry Naunheim, Jr.
Mystery, murder, mayhem and madness prevail on the Repertory Theatre of St. Louis Mainstage as “Angel Street” provides plenty of atmosphere and a top notch cast for this trip to 1880’s London. Not only did the film version change it’s name to “Gaslight,” but the term “gaslighting” became synonymous with one person attempting to drive another one mad by hinting that they’ve done things they can’t seem to remember. The dimming gaslights in the house on Angel Street become a key factor in this tale of a woman fearing she may be losing her mind. 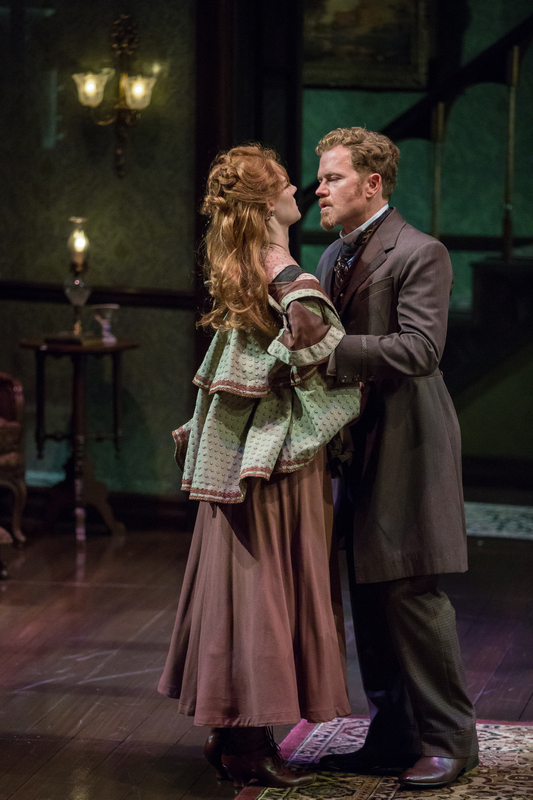 Janie Brookshire as Bella and Geoffrey Wade as Rough in “Angel Street” at the Repertory Theatre of St. Louis. Photo: Jerry Naunheim, Jr. The story is familiar to many as the play was written in the 30’s and has been a standard in many theaters over the years. So it’s not really a mystery as it is a psychological thriller. We know early on the who’s, why’s and wherefore’s, it’s just a matter of can the culprit be captured before he resorts to more drastic measures. Bella Manningham has been married to Jack for five years and they have recently moved to the posh, three story mansion that holds more secrets than we first realize. Her mother had gone mad and her husband finds excuses to remind her of this fact when he confronts her about missing items in the house and misplaced grocery lists. Janie Brookshire is perfectly cast as the frightened wife. She is obviously slightly afraid of her husband who can fly off the handle at a moment’s notice. But she is also unsure of her sanity as she is reminded of it every time she has a conversation with Jack. Ms. Brookshire never comes unglued or gets hysterical, she simply shows signs of being deeply afraid for many reasons. Rachel Kenney as Nancy in the grips of Clark Scott Carmichael as Jack in the Rep’s “Angel Street.” Photo: Jerry Naunheim, Jr.
As her husband, Clark Scott Carmichael is the perfect blend of a rugged and secure man but we can tell immediately that he is a conniver and probably has something else up his sleeve as well. It’s a delightful performance that makes the audience react on several levels. While Jack disappears on one of his nightly, mysterious adventures, we hear the doorbell and in comes retired Detective Rough. Confusing both Bella and the audience at first with his matter of fact yet mysterious manner and unrelenting questions, we soon realize he is a dedicated officer of the law who is still trying to solve a decades old case that has led him to the Manningham residence. Geoffrey Wade is slick and competent as can be, giving a humorous and personable quality to Rough. He is a perfect foil to the tension that prevades the play. 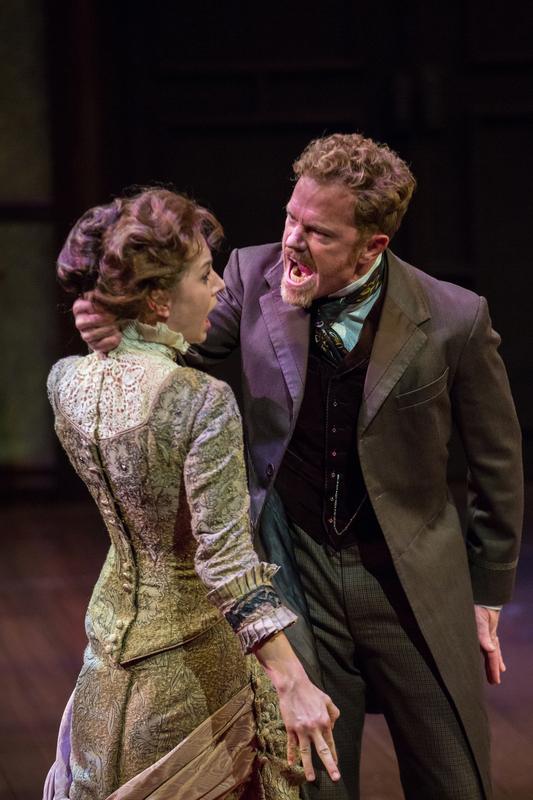 Bella (Janie Brookshire) is warned by Rough (Geoffrey Wade) in “Angel Street” at the Rep. Photo: Jerry Naunheim, Jr. The cast is rounded out by two essential pieces in the puzzle, the kindly personable maid, Elizabeth and the saucy, young maid, Nancy. Amelia White gives Elizabeth the essence of a long-standing member of the household staff who knows something is going on and tries to help in any way she can. Rachel Kenney delights as the perky young girl who we suspect may have her eye on the master and we soon see how that becomes another major plot device. Jenn Thompson directs “Angel Street” with a straightforward and principled hand. She evokes the true suspense inherent in the play and makes the audience gasp, cheer and hold onto their seats as the climatic scene plays out with just the right amount of tension and believability. She is ably assisted by a master group of technical people. 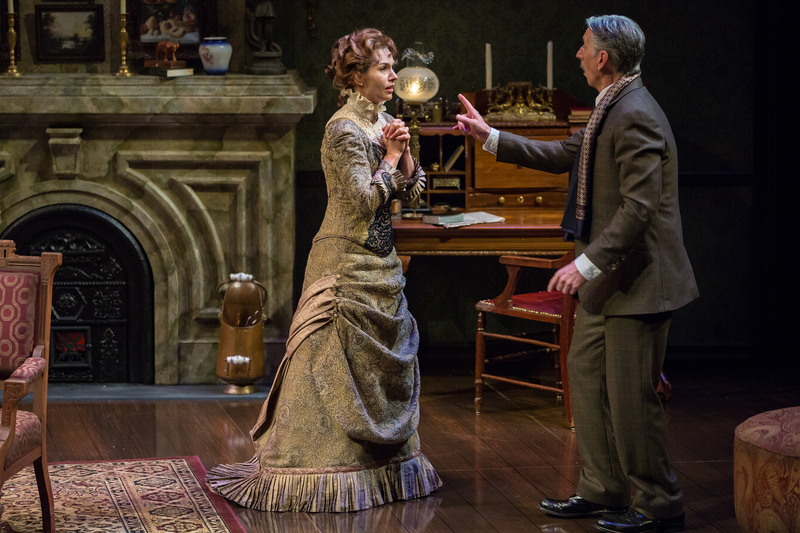 When the audience first walks into the theatre, it’s an odd looking set with the parlor of the Manningham house on the Mainstage and a fireplace that soars up a long, black backdrop. As it turns out, that backdrop is a scrim that reveals the three levels of the house including an entry hallway, two sets of stairs, Bella’s upstairs bedroom and just the hint of the third floor where more of the mystery is eventually revealed. Being behind a somewhat opaque scrim gives it an even more mysterious quality. It’s a masterpiece designed by Wilson Chin. Janie Brookshire as Bella gets yelled at by Jack, as played by Clark Scott Carmichael during the Rep’s production of “Angel Street.” Photo: Jerry Naunheim, Jr. 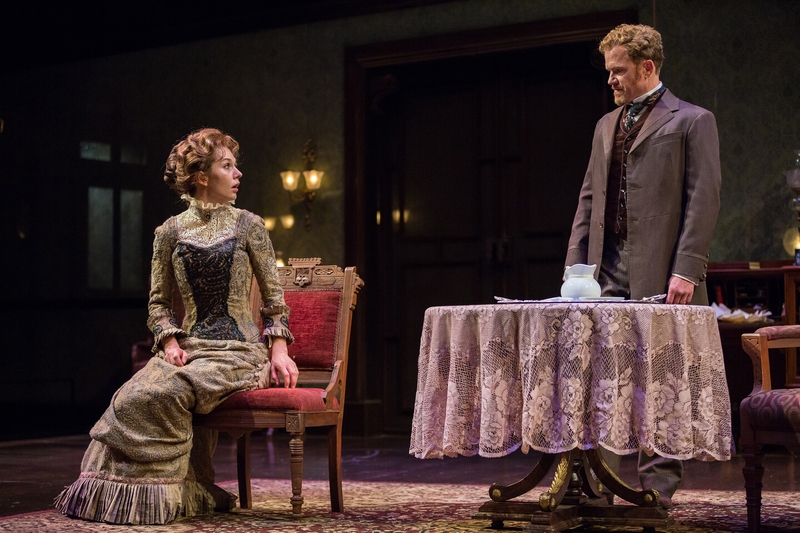 The veteran, Peter E. Sargent, has lit this production with exquisite mood-producing highlights and shadows, including those infernal gaslights hanging on the wall. Add Rusty Wandall’s superb sound design and you’ve got the complete package to bring the whole, eerie production to life. Another complete show with every piece clicking to perfection. It’s appropriate that the play runs through the Halloween season as it plays those mind games that can be scarier than any ghost or haunted house. Is Bella mad or does she know what Jack is doing to her? Is Detective Rough the real deal or does he hold nefarious plans? What roles do the maids play? For those unfamiliar with “Angel Street” or “Gaslight,” it will keep you guessing. For those who know the play, it’s marvelous to watch it unfold. Plan a trip to the Repertory Theatre of St. Louis between now and November 8th to see “Angel Street” as it should be done- the Rep way. This entry was posted on October 22, 2015 at 9:43 pm10 and is filed under Uncategorized. You can follow any responses to this entry through the RSS 2.0 feed. You can leave a response, or trackback from your own site.